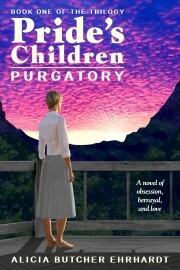 New posts which are about the books will be posted on Pride’s Children’s site, rather than at my writing site. If you have any questions for me about what you’ve read, please let me know there or at the address on the contact page (About) here. Pride’s Children’s spiritual roots are many; I will post about them as I have time (or someone asks!). There are now two reviews on the book’s Amazon page, and two on Goodreads. 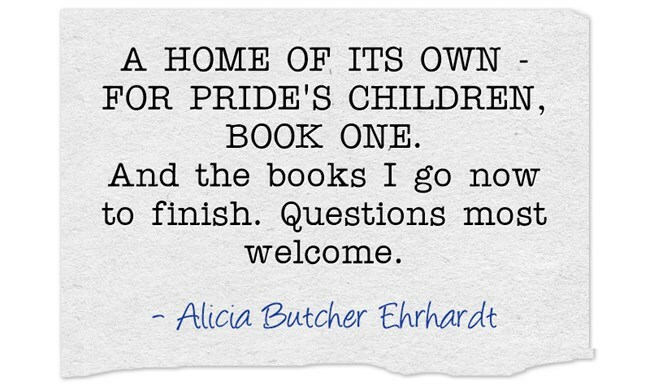 This entry was posted in Gen. Musings and tagged novel, Pride's Children, spiritual roots on November 28, 2015 by Alicia Butcher Ehrhardt. Have you ever held a hardcover book in your hands, one produced in the traditional way on an offset press by a publisher, and been very unhappy about the choices made by whoever designed the interior layout of the book? The gutter margin is so narrow that you are fighting the spine all the time you’re trying to read – or breaking the spine so it will lie a bit flatter. The part of the page with words on it seems surrounded by a huge amount of white space: the outside margins are huge. With all that space, they really should have made the letters bigger – so that you could read them. The running headers and footers are absolutely useless for navigating the book – there is no information there beyond the name of the book and a page number. The font is so light it is hard to read. The font is thick and dark and hard to read. The italics seem provided by a different alien species: smaller, much thinner, and with an entirely different appearance to them. The italics are almost indistinguishable from the regular font – except that they are slightly tilted, and maybe the lower-case ‘a’ is different. The script used for Chapter headings and other niceties is not legible. There are simply too many typefaces to the page. Have I missed your pet peeve? Drop it in the comments. But it isn’t easy to do this whole design thing, as you learn when you set out to lay out the chapters, scenes, headers, and text for your own book. I have 7000+ fonts acquired from Summitsoft. I have purchased the license to a few more fonts, and I have downloaded a few free ones to use. There are a LOT of fonts out there, in the same amazing variety as tropical birds. Feathers and foofaraws everywhere in sight, some mightily interfering with the readability of the font face, others (like the dyslexia font) designed to guide you gently to understanding. Add bold, italic, extra-expanded regular, xbold (extra bold), heavy, light… and you have enough choices to seriously shoot yourself in the foot. They have to play nice. Two or three COMPLEMENTARY fonts should do it on a page. Here the EDUCATED eye is the final arbiter, so go look at a lot of fonts and layouts, including nice templates sold on many helpful sites. If you find one you REALLY like, it may be easier – and cheaper (in time) in the long run – to purchase the rights to use one for your books. Or this series of books. If, on the other hand, you’re going to have to do a lot of customizing to get what you want, templates limit you. How often do you get to design a book? I don’t know about you, but it will be a rare occurrence for me, so, natch, I want to dig in to see if I can learn enough for basic competence. Plus add a few fillips I’ve always wanted. To make it beautiful to me. I wrote Pride’s Children a prologue (labeled it Prothalamion after the prologue in Dorothy Sayers’ Busman’s Honeymoon, one of my favorite books, and a spiritual ancestor to Pride’s Children). It is 145 words long (very short as prologues go), set AFTER the story that will occur in this book (note dates), and has caused a significant split among readers – some who loved the taste of the future, and others who thought I give away too much information. From the very beginning, when I added it about two years ago as I started serializing Pride’s Children on this blog, it was intended to be a fictional beginning to an article in The New Yorker. So when it came time to ask myself how it should LOOK, I repeated my pilgrimage to the august magazine’s website (the eye doctor’s office is where I normally read it in paper form – a subscription would bring me to a complete halt once a week), to get serious about the details. I took screenshots of everything from the masthead to the beginning drop caps on a few articles (nice big fat sans serif font, single capital, in a space to the left of the top three lines, its top slightly below the ascenders of that top line, and its bottom roughly level with the bottom of the third line) to how the articles are dated, titled, and attributed. I printed out the fonts that had potential from the Collection labeled Windows Office Compatible in my copy of Word 2011 for Mac, and started writing the same chunk of text in different fonts and strengths. And quickly ran into the uniqueness of the New Yorker’s font, Irvin. I didn’t need a LOT of the font – if you look at the image above, only a one-line phrase is in the special font – so I went looking for a proper license to use it – and discovered that there are several similar fonts out there, and a commercial license was $55 – per weight. It seemed too much for the one line, so I went digging, and found a lovely re-drawn New Yorker-type font – completely free, from Allen R. Walden, at Software Friends, Inc. He has a number of fonts similar to those of TV shows and movies. It is not THE New Yorker font, it is a similar one that gives, as we say in Spanish, ‘el tacazo’ – literally, the big taco hit; figuratively, the same impression. It comes in far fewer faces and weights, but for my purposes, it is perfect. I downloaded the font, the font page, and the license page for future reference, and proceeded to format the one line in the faux New Yorker font that no one will ever look that closely at! Word gave me a nice drop cap with Arial Black (a native font), and I chose Cambria for the body text of the ‘quote’, and several different weights of Arial and Arial bold. I gave the New Yorker a Department of Celebrities, and I think it will do – the purpose is not to distract you from the content (imagine how you would feel if it were in Courier 12? ), but to subtly emphasize the illusion of verisimilitude that fiction depends on so as not to suspend the reader’s disbelief. What next? Is it all this complicated? Thank goodness, no. I managed the ebook with NO fonts, using only the size of the font to set things off, and emphasizing with bold and italics. The user even gets to pick the actual font to read in. But there will be echoes of the Goudy Serial font I used for the cover in the Chapter headings, and the interior layout uses a lovely little font called Alido that I was fortunate enough to find in my Summitsoft package, and which comes in 7 different weights. This was my one hoped-for excursion into fancy fonts (we of my generation remember the craziness in printed materials when fonts were first made available to computer enthusiasts with things such as MacPaint); it would be tedious in the extreme to have to fight fonts all book long. I will play a tiny bit with fonts for the title page, etc., but I have had my fun, and now I have to go in, and format everything else for your reading ease and convenience. As we say, Your Mileage May Vary. If you recoil in horror, hand it all over to the pros. Me, I play. While we are playing, did you notice who wrote the article in the image? 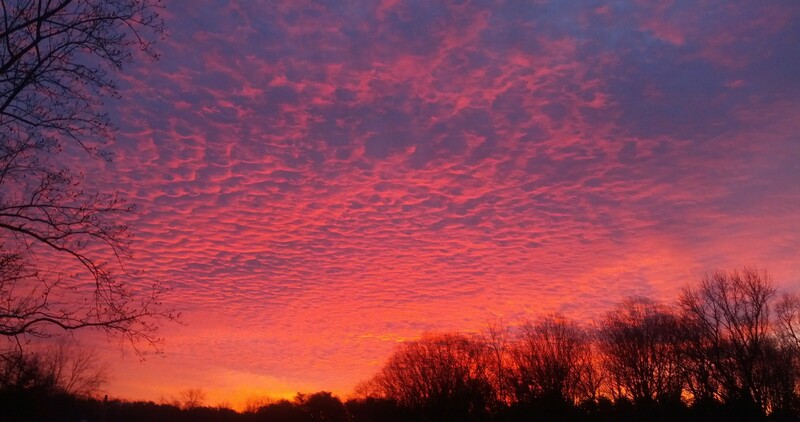 This entry was posted in Gen. Musings on November 21, 2015 by Alicia Butcher Ehrhardt. NEW WRITERS ARE TASTY PREY – SOME OF THEM HAVE MONEY TO SPEND! I’m new at this. Maybe I’m too sensitive, maybe I’ve been reading the self-publishing blogs too long, but it bothers me that I’m being circled by sharks before the ink is dry on my copyright notice (which led to a flurry of emails from a company offering to ‘publish me’) and the fifth and sixth ‘friend request’ on Goodreads come from 1) an ad agency wanting to ‘talk books’ pretending to be an actual person, and 2) someone offering me a long list of paid review services (for the uninitiated reader, paid reviews are unethical. Period). I believe people who have used paid commercial reviewers (Kirkus, if I recall correctly, offers such a service to indies: we’ll review your book for $495, but won’t guarantee we’ll print it or that it will be positive) have been unhappy with the results: expensive, and not resulting in sales. If you have any interest in those kinds of reviews, read a bunch of them and compare to the book/book sample – see if you agree with the reviewers – before you cough up cash. Other places advertise books – BookBub is one – and claim great results for additional readers AND reviews. Supposedly they’re worth the money – but they don’t solicit the writer; the writer goes to them. Readers and reviews have to be EARNED – it is a frustrating and time-consuming proposition. Here you thought writing a book was hard! This entry was posted in Gen. Musings on November 20, 2015 by Alicia Butcher Ehrhardt. I am acutely conscious that I am not producing blog content – or updating the look of the blogs – very frequently. I won’t say I’m sorry – that is lame. Or I am, but in a vague background way moderated by PRIORITIES. The current priority? Getting the POD out of my new process (which involves going from Scrivener, to Word, to a pdf, to CreateSpace – with a stop at Pixelmator for a full front-and-back cover). Why? Because then I will have some time during which I hope a proof copy will be winging its way to me – time I can use to fill some of the other holes in the process. Jumping the priority queue: new business cards? Today I will see someone who MAY be interested – and all of a sudden I realized I have nothing to leave with him. My old business cards are not suitable AND I’m out of them. I figured if I’m going to go to the trouble of printing new ones, I should take a few minutes (I can hear the laughing starting up already – cut it out!) and make a new one. Whip out Pixelmator. Oops. Not sure I remember how to do this. Whip out Word – the file where I have the old ones. Spend a frustrating hour remembering my Pixelmator tools, and fighting against the fact that what I know about HOW to do things is woefully and intrinsically opposite to what graphic artists live with daily (don’t get me started on how masks work – backward and counterintuitive). I manage to start regaining control when the file I change finally settles down at the size of a standard business card – 3.5 x 2 inches. The trick: store the canvas size you set FIRST – otherwise it assumes what you’re pasting in – the image of the book cover which will be a small part of the finished product – is the size you want, and your business card is now about an inch tall – and proportionately wide. I won’t bore you with the details – it wasn’t really hard, just counterintuitive because computers do what you tell them to do, not what you WANT them to do. Now I just have to remember my instructions to myself about where to cut these babies out of the page – so the finished product looks properly centered. And then get back to whatever was next in the queue before this little project took over. Nap! And lunch! And then the appointment for which I did this. You are now updated. I’m not lazy – just tired and massively overwhelmed by the delightful but unending learning opportunities that present themselves. This entry was posted in Gen. Musings on November 9, 2015 by Alicia Butcher Ehrhardt. This entry was posted in CFS - living and writing with ME/CFS/CFIDS, This writer's life and tagged brain fog, CFS, ME/CFS, Pride's Children on November 3, 2015 by Alicia Butcher Ehrhardt.